JOHN M. WISE. To say that a man has lived in Western Kansas over forty years is to classify him without further description as one of the true and original pioneers. It was in the month of October, 1874, that John M. Wise arrived in Pawnee County. If there is any feature of frontier experience which he has not learned by personal contact he does not know of it. He was introduced to this section of the state about the time the grasshoppers were performing their widespread scourge. He has seen the very driest years, seasons when grain would not even sprout, times when the grass withered and parched on the prairies, and when it seemed that no living thing could survive. Somehow he contrived to stay, to endure the worst and enjoy the best, and in later years he has not had to deny himself or his family any of the real comforts and conveniences. He came to Kansas from Virginia, but was born in Cumberland County, Pennsylvania, September 20, 1841. His early youth was spent in Frederick County of the Old Dominion. His grandfather, Michael Wise, was a Pennsylvania farmer and died near Carlisle, that state. Among his children were Samuel, Michael, Caroline, who married Comer Albin; Mary, whose first husband was Mr. Long and the second, Daniel Brindle; Annie, who married John Childs; and Catherine, who married John Yowell. Samuel Wise, father of John M., was a native of Pennsylvania, and when his son John was a child moved to Frederick County, Virginia, where he followed farming and blacksmithing. Though he had only a modest education, reading, writing and arithmetic, he possessed much energy and ambition, and always managed to live well and provide for his family. He was born in 1811 and died in 1876; at Madison, Alabama, where he spent his last years. Late in life he became a member of the Methodist Church. In politics he began voting as a whig but after the rebellion was a democrat. Samuel Wise married Sarah Line, who also died in Madison, Alabama. 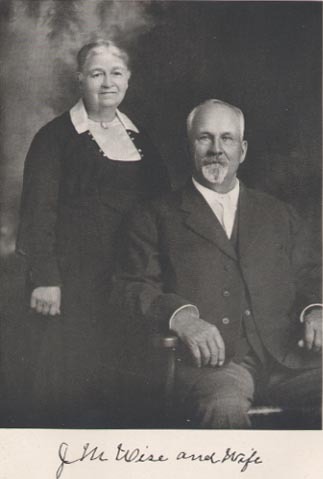 Their children were seven sons and one daughter: Sarah, who married James H. Cantor and died in Frederick County, Virginia, and is buried at Winchester; Samuel, who died at Hillsdale, Oklahoma; John M.; William, who died at Beaver, Oklahoma; David, who died in Frederick County, Virginia, in 1862; Henry, a carpenter in Frederick County; George, a merchant and president of the bank at Madison, Alabama; Arthur, also a merchant at Madison, where he died. John M. Wise spent his early youth in the picturesque and beautiful Shenandoah Valley of Virginia. He had a good home, attended the country schools, and for a time was a student in a college at Winchester. He became a member of the Cadet Corps there and acquired considerable knowledge of infantry tactics and drill. Thus he was not completely a raw recruit when in April, 1861, he enlisted for service in the Confederate army. He became a member of Company A of the First Virginia Cavalry. His captains were successively Drake, Lock and Trussel and his first colonel was the great cavalryman J. E. B. Stewart. Later he was under Col. W. E. Jones, Col. Fitzhugh Lee, Colonel Drake, who had been promoted from captain, and finally under Col. W. A. Morgan. The First Virginia Cavalry rendezvoused about Manassas, where the first battle of Bull Run was fought. Mr. Wise saw his first actual fighting around Richmond and during the Peninsula Campaign of 1862. He was in all of the Seven Days battles, ending with Malvern Hill on the James River. Following this campaign the regiment went into Maryland, was in the battle of Antietam, and subsequently covered the retreat of the army into Virginia. He fought at Fredericksburg, in the battle of Chancellorsville, and was in the three days' fight at Gettysburg and was slightly wounded on the last day. The regiment then wintered at Bowling Green, Virginia, and the spring opened with the Wilderness campaign. He was at Spottsylvania, and from there the regiment was sent after Sheridan's forces and fought the battle of Yellow Tavern, where General Stuart was killed. He was in the operations around Richmond and the Petersburg Campaign. General Fitzhugh Lee succeeded General Stuart and the Lee Corps joined the Early forces in the Valley of Virginia. Mr. Wise was in the historic and memorable campaign of the Shenandoah Valley and in the battle of Winchester. His regiment then saw active service during the concluding scenes around Richmond and the retreat to Appomattox. The First Virginia Cavalry was part of Lee's diminished armies that surrendered. They were well out to the edge of the army at the time, and when Mr. Wise and some of his comrades witnessed the approach of a Union officer with a flag of truce and suspecting the surrender, he and others left the command and did not surrender at the time. Mr. Wise's first purpose was to seek General Johnston's army in North Carolina and continue the fight. However, when he learned of the generous terms of surrender offered by General Grant, he went back home, surrendered and was paroled at Winchester. Four years of warfare had left devastation and ruin in their track. The Shenandoah Valley where he had passed his boyhood was a very different country from what he had known before the war. Mr. Wise, like many other Southerners, made the best of the situation. He had his old army horse and a few animals that might properly be described as "plugs" he used to make his new start in life. For a time he raised corn and potatoes, and gradually built up a stock of hogs. The spring of 1865 came very early, the grass grew luxuriantly, and it seemed as though Providence was kind to the war stricken kind. Mr. Wise remained in Virginia until the spring of 1874, when he took his family to Alabama, where his parents then lived, and in the following fall came to Kansas. He arrived in Pawnee County by railroad and brought with him his wife and two children. His possessions on arriving in the state were household goods, clothes and bedding and about $400 in cash. Leaving the train at Pawnee Rock Mr. Wise pre-empted the quarter section of land where he now lives in Larned Township. It is the northwest quarter of section 12, township 21, range 16. Subsequently he homesteaded eighty acres of this. His first home was built of frame, 12 by 18 feet, a story and a half high. There was also a temporary shelter for his yoke of oxen and pony. The oxen pulled the plow for the breaking up of his land and for other farm work, and occasionally were hitched to the vehicle which conveyed the family to church. At other times the family walked to attend church services at Pawnee Rock, and it is Mr. Wise's conviction that all of them enjoyed the sermon as much as if they had come to the House of God in an automobile. Mr. Wise came from a great fruit section, and naturally he attempted to improve his land with an orchard, but his trees were subsequently ruined by a hail storm. He also bought a couple of cows, and as rapidly as possible he developed a herd of live stock. Stock raising has always been an important feature of his enterprise, but for years there was little profit in it because of low prices. He soon discovered that Pawnee County was a pre-eminent wheat growing district. But he was unable to engage in wheat raising on an extensive scale for some years. This was due to the fact that he had a limited acreage, and he could not buy additional land until about 1882. Since then his purchases of land have been somewhat more frequent, and all of it has been bought and paid for through his industry and his farm products. He now owns three quarter sections and an eighty. His farm is bisected by Ash Creek. In contrast to the scenery to which he had been accustomed as a boy in Virginia Mr. Wise naturally noted the almost complete absence of timber in the early days in Pawnee County. One or two small bushes growing along the creek made up all the shrubbery in evidence. Since then he has developed by planting and cultivation sufficient timber for farm use. He set out many cottonwoods in the early days, chiefly for shade purposes, and these trees are now fit for saw logs. Besides what he did do through his individual industry Mr. Wise also co-operated with his neighbors in establishing local institutions. He helped organize the school district and he was chosen to teach the first term of school in the little frame schoolhouse of district No. 9. He has almost continuously served the district in some capacity as clerk or director and is now its treasurer. He was also elected justice of the peace. He was elected and qualified for that office before his political disabilities as a former Confederate soldier had been removed, and he forgot entirely that he was not a citizen in the eyes of the law. He also served as township clerk. In national politics he has generally voted democratic, though he has been a very ardent advocate of prohibition. It was his support of that cause which made him an active adherent of St. John for governor. He takes great pride in the prohibition record of Kansas. The recent state and national enactment extending and emphasizing the prohibition principle has caused him very sincere pleasure. On coming to Kansas the family became Presbyterians and now hold membership in the Larned church. Mr. Wise was married in Frederick County, Virginia, February 15, 1870, to Miss Mary Virginia Hale, who was born there May 6, 1851, daughter of Lewis W. and Mary (Emmett) Hale. Her father was a native of Frederick County and spent his life there as a farmer, dying when about seventy-eight years of age. Mrs. Wise's mother died in 1852, and she was one of two children, her brother being Lewis E. Her father married for his second wife Sarah Whissen, whose children, John C. and Mrs. Henrietta Stimmel, both live in Frederick County, Virginia. Mr. and Mrs. Wise have three children: Emmett, an employe of the Trinity and Brazos Valley Railway Company, living at Fort Worth, Texas, married Nora North; Sarah is the wife of Edwin A. Smith, of Pawnee County, and has a daughter, Virginia; Bernice H., the youngest child, graduated as a member of the class of 1918 in the Kansas State Agricultural College at Manhattan, is a high school teacher at Carbondale, Kansas.